Most people who play the stock market are missing out. They're not using the most powerful weapon in a trader's arsenal - options. Although options are most popular with millennials, they're not just a young person's game. They can be used by anyone to supercharge their portfolio. With stocks, a 5% or 10% gain in a day would be mind-blowing. With options, you can see 2,000% gains or more in a few hours. Of course, those are extreme examples. But in general, the potential gains of options trading are much larger than with stocks. So it's no wonder options are becoming popular. An option is a contract. Its holder has the right - but not the obligation - to buy (call option) or sell (put option) a certain amount of an underlying asset at a specified strike price before the expiration date. 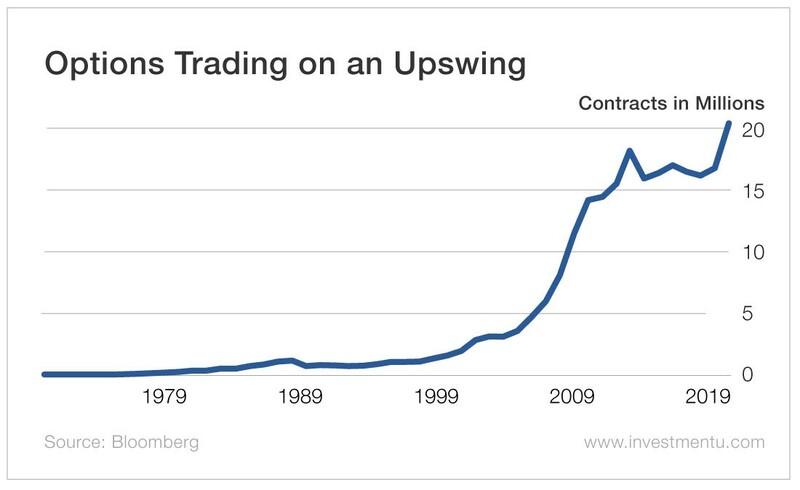 Usually one option contract represents 100 shares of the underlying stock. For example, IBM's January 15, 2021, $140 calls would give you the right to buy 100 shares of IBM stock for $140 per share by the expiration date. However, when news of the merger went through, Alteria's share price shot up to $44.50, or $8.50 above the strike price. So each of those $0.35 options went up to $8.50 in value. That's a 30% change in share price and a 2,329% change in the option's value. Options gurus Bryan Bottarelli and Karim Rahemtulla have teamed up to teach investors the art of smart speculation. Far from the reckless reputation options traders have picked up, smart speculation allows you to make consistent and profitable plays in the options market. Subscribers to Trade of the Day - a completely free e-letter - receive precise, calculated strategy speculations every trading day. Karim and Bryan have options trading distilled to a science. With their help, you can gain access to the best tool you never knew you had and get into one of the fastest-growing types of investing.